Snorkeling Alligator Reef was simply wonderful. 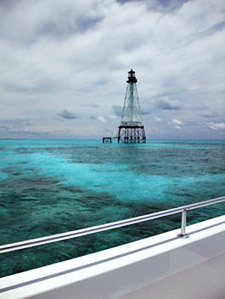 This spot is located out on the barrier reef, and decent boat ride away from the Islamorada area. 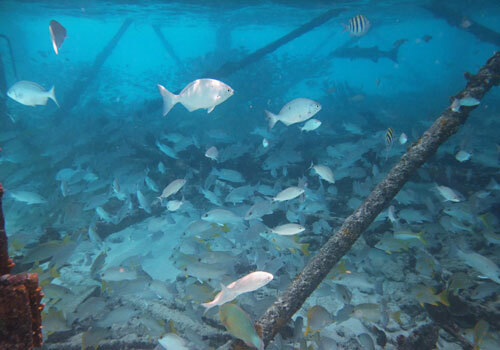 The snorkeling grounds are located around and under an old lighthouse tower that marks the shallow reef. 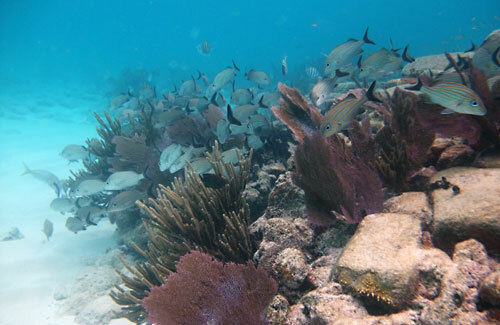 Unlike some of the closer in patch reefs that tend to have cloudier green water with lower visibility, this area has a constant flow of very clear blue ocean water, providing excellent visibility. And that fresh flow of water is what attracts a lot of fish to this spot, along with the shade provided by the lighthouse structure. 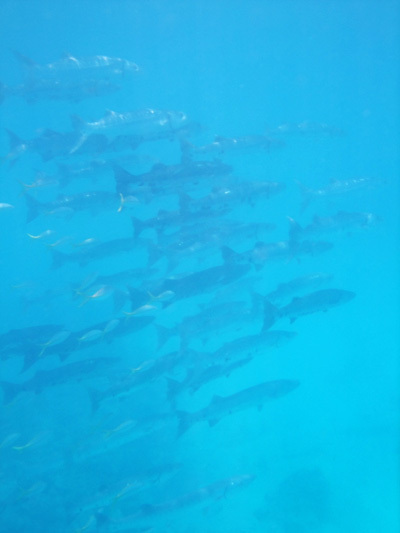 And in the deeper waters close by you can find many bigger species, like Barracuda. And Galen also had a rare encounter here with a Hammerhead Shark (see picture below). The first area is the shallow patches next to the tower, one of which is a small mound of ships ballast stones that came from the ship that this reef was named after, the Alligator, sunk in the 1800s. All that is left is a mound of stones you can see below. These stones were covered in a Medusa's hair of moving fish. It was crystal clear and like an aquarium. 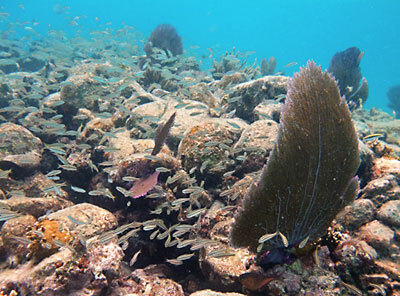 All around the tower there were many purple sea fans, and some sponges, but little to no hard corals. Below you can see some of the fish and other sights we noticed in this area. The second area is underneath the lighthouse itself. 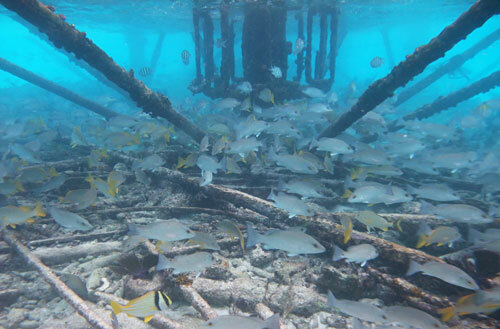 A mess of steel supports and thousands of fish await you. 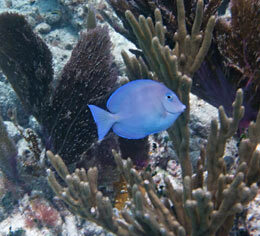 Big schools of Grey Snappers, Barracuda, and just about every other type of small reef fish hang out in the shade. 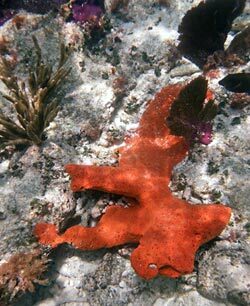 This is probably the highlight of snorkeling Alligator Reef. 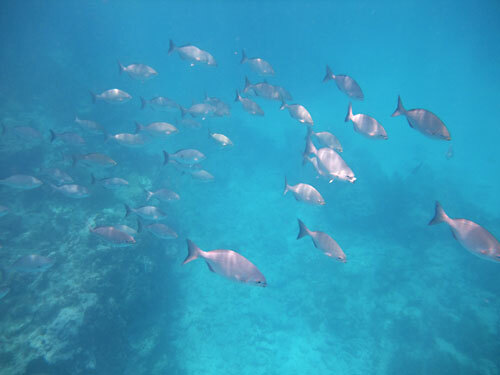 The third area is a very short boat ride east that brings you to much deeper waters with bigger fish and a rock wall that fish schools tuck under for protection. 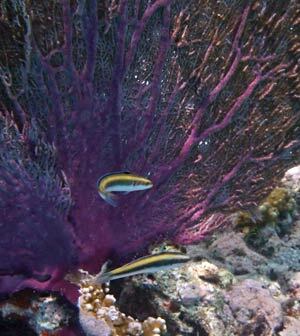 The depths here are around 20 feet, which is a bit deep for snorkeling, but we enjoy it anyway. It offers an interesting mini wall with a ledge that runs north to south. 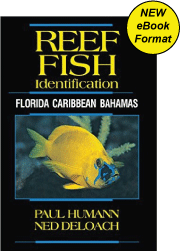 There are tons of Sergeant Majors, Yellowtail Snapper and Bar Jacks. Big schools of grunts hang out under the ledge. 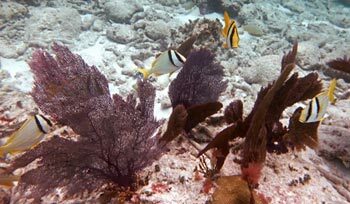 At around 15 feet there were huge Midnight Parrotfish, grouper, Amber Jack, a Nurse Shark, Rock Beauty and some monster French Angelfish. 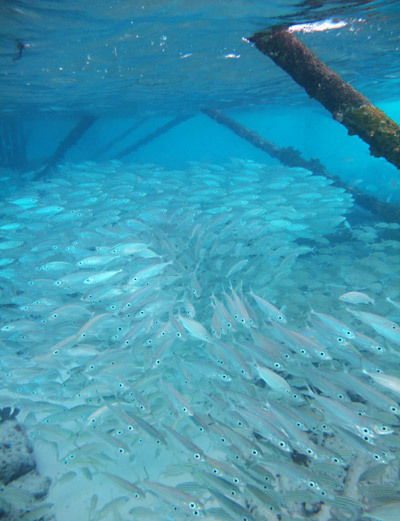 We also encountered the largest school of barracuda we have ever seen. There must have been twenty five huge barracuda hanging in the current flow off the ledge. It was kind of unnerving. 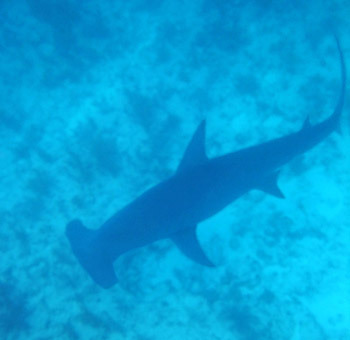 Galen also had a very rare and amazing encounter with a Hammerhead Shark while snorkeling Alligator Reef. He saw movement off to one side and suddenly saw a huge body swimming my his way. It was a Hammerhead Shark about 11 feet long moving with great speed and incredible ease. The shark noticed Galen and swam his way, passed underneath, and was swiftly gone. Galen only had a moment to get one poor quality picture. It was an unnerving and kind of stunning experience. Galen's heart was pounding a bit. It was just weird how fast he was traveling, without doing much. Later our boat captain said that after five years of doing tours in that area Galen's was only the second sighting of a Hammerhead Shark.